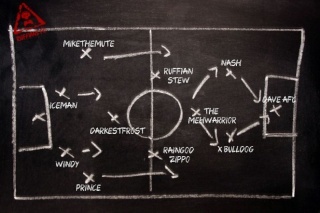 Ruffians FC will be once again taking to the field this wednesday. So far this season fixture nights have been proving popular so can I just reiterate the importance of signing up in the forum to secure your place. Whilst we try and make sure everyone gets a chance to play, priority will be given to those who sign up in the forum. Also please can I ask that if you see our 'Any' player playing in a certain position, ask them before you take that position! As a default, if the position is filled by another player, then the 'Any' pro will be put in goal.... No idea why (another one of EA's many quirks!). We will try and mix the positions up if people feel like they are not getting played in their favourite position, however we can only play so many people in certain positions. Priority of positions will be given to those who signed up in the forum... hence why it is vital that you signed up! If you are not sure if you are going to make it or not, still let us know and you can be put on the subs bench. Places are on a first come first served basis but we will try and accomodate everyone who wants to play on a fixture night as best we can. Finally just a reminder about the club itself, we are currently not accepting new members to the team but if you have played for Ruffians FC in Fifa 14, then please can you go to the sign up page (link below) and sign up to ensure you get an invite into the club.